The Doors are inextricably linked to '60s counterculture. Taking their name from Aldous Huxley's book The Doors of Perception, the group followed Jim Morrison's dark poetic vision to massive commercial success, making The Doors one of the best-selling bands of all time. This folio contains drum transcriptions of 20 of the band's most classic songs, including the vocal melody and lyrics. 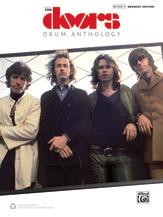 Also featured is an in-depth stylistic analysis of drummer John Densmore's contribution to The Doors' captivating, melancholy sound. Titles: Blue Sunday * Break On Through (to the Other Side) * The Crystal Ship * Five to One * Hello, I Love You * L.A. Woman * Light My Fire * Love Her Madly * Love Street * Love Me Two Times * Not to Touch the Earth * Peace Frog * People Are Strange * Riders on the Storm * Roadhouse Blues * Soul Kitchen * Spanish Caravan * Touch Me * Twentieth Century Fox * Wild Child.